Look how cute we are! 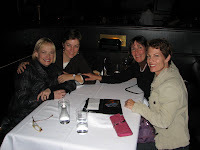 Courtney, Maureen, Cathy and I have been friends since freshman year in high school. I am so pleased that we have maintained our friendship. We love hanging out and make each other laugh. Courtney lives in Utah, Maureen in North Carolina, Cathy in Wisconsin…and I live in Missourah. Our next trip together…Martha’s Vineyard in October. There are a million reasons why we could NOT meet up. And only one reason to get together. For the fun of it. Courtney will make sure we ditch the “mom jeans” and outfit us in Urban Blues. Cathy will “fire up” my toothbrush and dazzle with her political insights. Maureen will share stories of her over-achieving bilingual kids and I will cringe, having raised my boy on junk food and questionable TV choices. In good times, rough times, rolling in the dough, rolling coins…my bare bones advice: Go for the fun. PS I’ve been rich and I’ve been poor. I like rich better. Money buys options. Check out The Challenge.